Front view of Creagh House later to be the 1st sanatorium. Rear of Creagh House where sheep grazed - no sign of the goats! 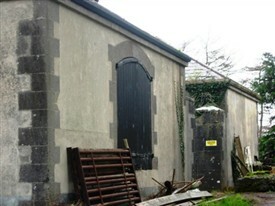 Remains of Creagh House and the chalets for male and female patients. One can see part of the tranquil park-lands & trees. At certain times of the years it would not have been unusual to see many removals from this doorway of the morgue. Its height from ground allowed coffins to be slid directly into the hearse. 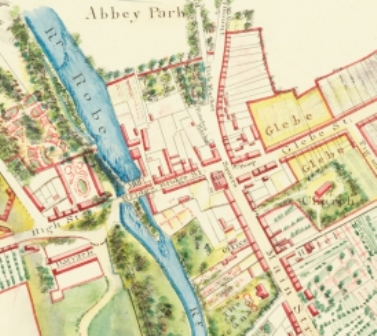 The original house [in a different location] was situated beside the River Robe and was described in September 1836 by Robert Graham as a ‘nicely laid out cottage residence’. Earlier, in 1786, Wilson refers to it as the seat of Mr. Cuff. Mary Louisa Cuffe was leasing the property from Colonel Charles Knox at the time of Griffiths Valuation, when it was valued at £32. 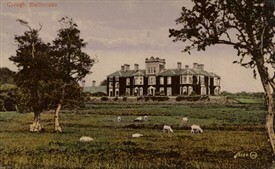 A new mansion was built by Colonel Charles Knox in 1875, which became a tuberculosis sanatorium. In 1924, the Creagh Estate was handed over to County Mayo Board of Health to be used as a Sanatorium for T.B. patients. Until 1954, approximately forty and fifty patients at a time were accommodated there under the supervision of Dr. James Gibson Thornton, Castlebar, who held clinics in the principal towns of the county through which patients were admitted to Creagh, then known as St. Theresa’s Sanatorium. In the early days hope of a cure for this dreaded scourge was minimal. It was ‘coughin in and coffin out’. March and October were the worst months for T.B. deaths. There were a few weeks in these periods when there were up to twelve bodies in the morgue; once the Colonel’s (Knox) coach house. Most of the patients were immigrant workers from Achill, Mulranny and North Mayo, who had contracted T.B. in the harsh conditions of the Scottish tatie fields, the tillage lands of Lincoln and Cambridgeshire, the coalmines of Wales, and in the sometimes grim housing conditions available to people in indoor services during World War II. Creagh with its beautiful trees, shrubs and green pastures was a haven for these people. The spacious bedrooms on the top storey were converted into wards and, if they were not too ill the patients savoured gracious living in the magnificent dining and drawing rooms downstairs. Dr. Thornton who was an advanced thinker with regard to farm management made sure that they had only the best in the way of milk, eggs, vegetables and fruit- meat and bread being the only two items purchased outside. He used to tell farm workers; one of them was Michael Kelly, a nephew of Gardener Mike Partlin, that he got his best ideas when he could sleep at night. Michael, now a landscape designer in St. John’s Wood, London, at the residence of the Chairman of Monopolies Commission, Mr. Sydney Lipworth, remembers Dr. Thornton’s many innovations including easily removable fencing for the rotation of crops, and the careful monitoring of twenty-eight milk cows whose yield was weighted each morning and noted in special records- so that calves could be bred from the best animals. Patients who were in reasonable health were encouraged to walk around the grounds and some of them loved to help with light farm chores in the meadows and tillage fields. Many became so attached to Creagh that they dreaded the monthly clinic, which was held on Sunday, in case Dr. Thornton would tell them they were well enough to go home; an understandable reluctance since home was often in an isolated village with few comforts and scanty food. They knew they would miss the routine of a walk after breakfast, a rest after lunch, four o’clock tea, another walk, then supper followed by music or a singsong before lights went out at nine o’clock. Martin Walsh, Cloonkeary, also has memories of these days when he worked as an Assistant Gardener to Mike Partlin from July 6th, 1948 until December 13th, 1952. He was a young boy when the disastrous fire of 1939 destroyed the main building where patients were housed. As there was then no adequate Fire Brigade in County Mayo permission had to be sought from the County Manager to bring in the Galway Brigade. This meant a delay of several hours in which, despite heroic efforts by Mike Partlin, Tom Toole, Tom Partlin, Richard Mellett and Barney Joyce, the fire gradually engulfed the wide staircase and raged through the bedrooms minutes after all the patients had been rescued. Martin O’Connor, Sister Wallace, nurses Cotter and Gibbons together with wards-maids and domestic staff made patients comfortable on the lawn until they could be taken by ambulances to the hospitals in Castlebar. People from the locality who gathered to help during the fire were so terrified of catching T.B. even by going near the patients, that it look double courage to face this hazard as well as the smoke and flames, but they took the risk and no lives were lost. Patsy Shaughnessy, however, tells me that he took no risks when as young Mass-server he refused a mouth watering breakfast of bacon, egg and sausage one Christmas morning. He waited outside until the priest has finished his in the hope of getting a reward for his good deed. The half crown which the priest gave him was then riches to a schoolboy! After the fire the Sanatorium was out of operation for two years until the new chalets with verandas were built. These housed twenty two men and twenty two women in each unit. Martin Walsh spoke wryly about the ‘segregation of men and women close to death, as they lay in their beds or just sat in the sunshine, but that was rule of the time’. Walking through what was once a beautiful garden, but which is now bare of all vegetation except weeds, Martin talked of the efforts of the Sanatorium directors to make the place self-supporting during the war years. They decided to put sheep, which would be fattened for slaughter, into the garden, but the sheep ate plants which caused many of them to die. It was then decided to put in goats to eat the poisonous plants, but the goats being adventurous animals got out, climbed on to the verandas or any place climbable and proceeded to denude shrubs around the nurses’ home (the remaining part of Creagh House). Whether they were retained for their milk which was considered good for T.B. patients is not clear, but the garden was made sufficiently goat proof to hem them in; so in time all of Mike Partlin’s lovingly tended plants, plus the peach and pear trees disappeared. In 1959, Creagh with three hundred and fifty acres was sold to An Foras Talúntais by Mayo County Council and served as a Research Station for the next thirty years. The nurses’ home was turned into an assembly hall for committee meetings, field days, lectures, etc. Offices, kitchen and dining room facilities were also provided. The land was restocked with sheep and cattle and west of Ireland farmers benefitted from the knowledge gleaned through testing and experimentation with breeding stock. In the late seventies, after Dr. John Mulqueen was appointed Director and important job of reclamation was carried out on the cutaway bog bordering the Castlebar road. Now the heather and scrub are replaced by lush green grass and the damage done through removing bog mud for fertilisation is completely repaired. Most of the forests still remain and the deer, when sated with the sweet green, grass in the parkland, like to take their noonday siesta under the trees to the rear of Creagh House. 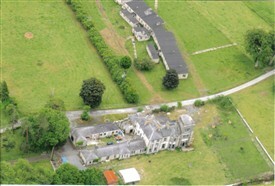 In 1975 The Institute moved its operations to Belclare near Tuam and the farm was sold to a private owner. See further information on Dr. Noel Browne who during his medical career witnessed the ravages and tragedy of TB and its prevalence, particularly in poorer areas in Ireland. He decided the only way to improve the situation was to join politics and try to eradicate (successfully) this disease. This page was added by Averil Staunton on 12/08/2017. Well done Averil ...a brilliant article of this time and place.